If you are looking for a unique gift idea for a geographer in your life beyond yet another atlas, globe, or wall map, find some ideas here for unique geographically themed gifts. 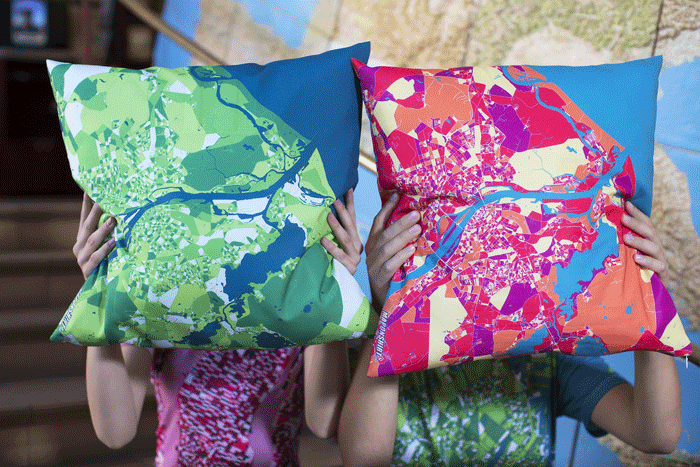 Choose any location on earth and create a custom all-over-printed tees, pillows or headwear via MapOnShirt.com. Products can be further customized by choosing a color theme and adding text, logos, or placemarks. The company won the “Best Beautiful Map” award at FOSS4G Seoul in 2015. 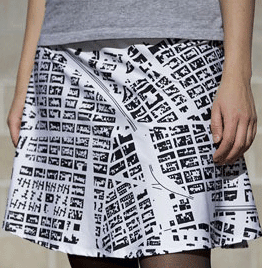 Developed by data visualization specialist Rachel Binx, Monochōme is an online clothing store that allows you to custom print OpenStreetMap street data onto skirts, tank tops, and t-shirts. To order, enter an address, select one of two monochromatic styles, adjust the map view, select the desired size, and order. Since OpenStreeteMap doesn’t have 100% coverage of the world, not all addresses will be printable. To complement the map clothing, Lat & Lo offers customized jewelry with custom latitude and longitude coordinates. Choose from a range of necklaces and bracelets. Lat & Lo offers customized coordinate necklaces and bracelets. 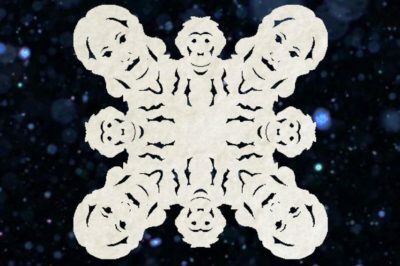 With the advent of sites like Etsy, it’s easier now to find unique one of a kind items. Independent artists and craft makers offer a range of interesting and uniquely geographic offerings. To see what’s available this gift-giving season, search for keywords like “geography” or “map” to find items like custom maps, cartography wear, map ornaments, and geography themed jewelry. It’s also a great place to find vintage geography books and map prints. Since many of the items for sale are limited in number, you can find a unique item as a gift such as All Mapped Out’s vintage map coasters. 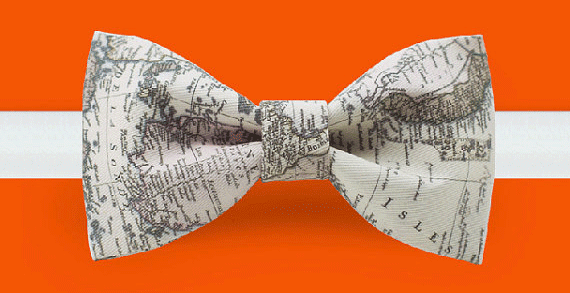 For the dapper geographer in your life, try this map bow tie from Etsy. Old geography textbooks, previous volumes of National Geographic magazine, and historic maps all make great geography related gifts. If you know the specialty area, you can try and find vintage textbooks and geography books that match that area whether it be human geography, biogeography, or a range of other geography niches. Alternatively, a historic map of a geographic area that the intended recipient is interested in is always a thoughtful gift. 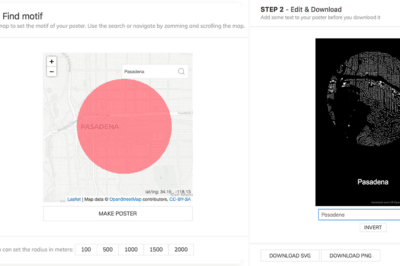 If you don’t have the budget for an original map, there are many online sources of scanned historic maps such as the Library of Congress (see: where to find historical maps online). You can then download a digital version of the map, have it printed at a printer shop, and then nicely framed. Make a charitable gift to a geography organization in the name of a geographer. For example, National Geographic accepts donations that go to support research and conservation projects, educational programs, and public outreach. GIS:YES is a charity that sends volunteers into impoverished areas in order to teach local residents how to use geospatial technologies to help their communities. Buy the gift of membership to a geography organization. A gift of membership provides many geography related benefits to the recipient such as monthly publications and access to lectures and events. Some suggested organizations are the Royal Geographical Society, Association of American Geographers, and the National Geographic Society. For those with larger wallets, National Geographic Expeditions offers once in a lifetime travel and photography workshop opportunities with its National Geographic Fleet which travels to locations around the world.